Tim Rice and Andrew Lloyd Webber's award-winning musical, Joseph and the Amazing Technicolor Dreamcoat, returns to the London Palladium for a limited run this Summer! The musical follows the story of Joseph and his journey after being betrayed by his brothers, as told by the Narrator, Sheridan Smith. Jealous of the favour Joseph has of their father, symbolised by Joseph's multi-coloured coat, his 11 brothers plot to rid themselves of Joseph. Subsequently Joseph finds himself as a slave in Egypt and must work his way up to earn his freedom. PLEASE NOTE: Hotel Direct can not guarantee the attendance and performance of any particular actor. 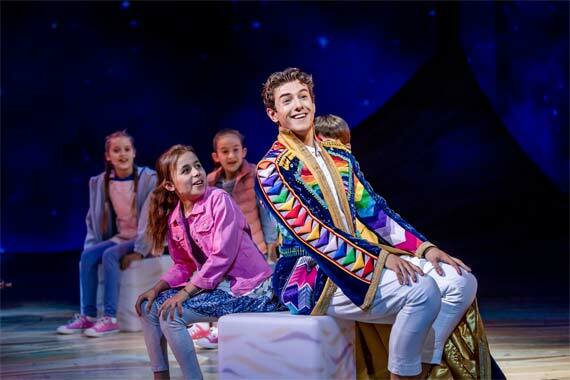 Joseph and the Amazing Technicolor Dreamcoat is based on the Bible's "Coat of Many Colours", it features music by Andrew Lloyd Webber and lyrics by Tim Rice and is the first musical from the two to be performed publicly. The show was originally shown at a school in London in 1968 and was only a 15 minute "pop cantata". It was not until 1972 that a 35-minute version of the musical was performed professionally at the Edinburgh International Festival. In 1974 the show was produced in full and performed at the Haymarket Theatre, following this the show was recorded later that same year. The show has featured many famous names throughout it's multiple shows and tours, including Jason Donovan and Phillip Schofield. The show also made it to film and stared Donny Osmond in the title role. With your theatre tickets and hotel booking made in one reservation, it is possible to save up to 50% with Hotel Direct. Choose one of our great packages and don't miss this much-loved show. There are currently no reviews for this show as it has yet to open. "Every minute of the show was spellbinding, I would highly recommend it." "a show not to be missed. Surprisingly i found Gareth Gates in the role of Joseph to be an outstanding choice. however the main show stealer for me was the character portrayed in the vain of "elvis presley". definately a show to go out and see!!" Joseph and the Amazing Technicolor Dreamcoat Rating:	91%	out of	100	based on	17	reviews.